When you're considering your options for a full-sized family minivan to drive in Monticello, consider the new 2019 Dodge Grand Caravan. It was designed with safety in mind and will get you to your destination comfortably. Robert Green Chrysler Dodge Jeep Ram can show you the different features that will help you maintain control of the vehicle in difficult driving conditions. The Dodge Grand Caravan comes with all-speed traction control that will make adjustments to maximize your traction on the road. The electronic stability control will monitor your steering and help you keep your car moving safely down the road in slippery or wet conditions. 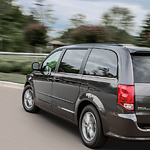 The Dodge Grand Caravan is made of a high-strength steel that will keep you protected during an accident. The design was made to maximize the vehicle-impact performance. The seven advanced airbags will help protect you and your passengers.